Echocardiography focuses on the evaluation of the heart, its valves and chambers, and associated vessels. The echocardiography certificate produces competent, compassionate, and responsible professionals and leaders who are skilled in ultrasound scanning techniques and the operation of ultrasound instrumentation. The certificate in echocardiography is an 18-month program that includes a clinical internship. The program, which focuses on the evaluation of the heart, its valves and chambers, and associated vessels, has been designed to exceed the objectives of the Joint Review Committee on Education in Diagnostic Medical Sonography. The program produces competent, compassionate, and responsible echocardiography professionals and leaders. This certificate is available to all registered allied health practitioners as well as those holding an associate or bachelor’s degree in a relevant discipline. The certificate includes lectures and course work integrated with a clinical internship. Depending on a candidate's previous course work, certain prerequisite courses such as a patient care course may be required prior to or during enrollment in the program. Contact the program director for further information on prerequisite course work and degree options. under guidance from faculty and professional staff, become capable of scheduling and performing the daily workload of ultrasound procedures, of evaluating new procedures where necessary, and of supervising other technical personnel. During the first academic year, students complete all the prerequisite courses required to enter the clinical internship phase of the program. Students also apply, polish, and test their clinical skills and techniques in the on-campus ultrasound scanning suite, which is equipped with a variety of ultrasound equipment. Following a required two-week pre-clinical internship orientation session, students begin their training at the first of two assigned clinical training sites. 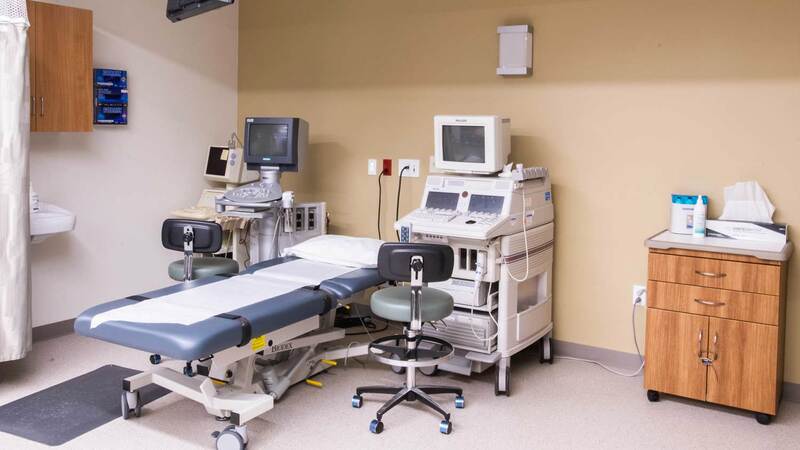 In addition to the echocardiography certificate, RIT also offers a bachelor of science degree and a certificate in diagnostic medical sonography. Both of these options are designed to meet the growing needs of the national and international medical communities. The clinical internship is divided into two rotations completed at various medical facilities. After successfully completing the first year of course work, students are assigned to a clinical training site. At these facilities, students work side by side with physicians, echocardiographers, cardiologists, and other health care professionals to learn, develop, apply, sharpen, and master the necessary skills to perform various echocardiographic examinations. Each student’s clinical progress and performance is closely monitored by faculty. Upon completion of the program, graduates are eligible to take the national certifying examinations. This course is designed to provide students an opportunity to learn the basic anatomy, physiology, basic pathophysiology, and terminology of the heart. Standard views, image orientation, ultrasound appearance and measurements will be stressed. Students will be required to dissect and label all sections of the human heart. Students are guided in the learning process by lecture and self-paced laboratory experience. This course is designed to provide students with the opportunity to learn cardiac imaging procedures, sectional anatomy, and patient positions. Standard views, image orientation, ultrasound appearance and measurements will be stressed. This course is designed to provide students with the opportunity to learn advanced cardiac imaging procedures, sectional anatomy, and patient positions. In-depth and advanced review of standard views, image orientation, ultrasound appearance and measurements will be stressed. This course addresses how the principles of ultrasound physics are directly applied to the use of ultrasound instrumentation in medical imaging. Transducers, signal production, memory systems, data display, manipulation of controls, and artifacts, are discussed. Throughout the course, the student will integrate previous knowledge of anatomy with ultrasound physics and instrumentation. This course is a continuation of Sonography Physics and Instrumentation I (DMSO-309). It provides a foundation of the basic physical principles of ultrasound and the fundamentals of fluid dynamics, Doppler physics including color, power, and spectral Doppler, quality control, Doppler artifacts, and biological effects. Students will learn to integrate previous knowledge of anatomy, ultrasound physics and instrumentation with Doppler skills and techniques. Development of scanning techniques, use of instrument controls, and production of high quality diagnostic images utilizing laboratory equipment are stressed. This course exposes the student to the role of the electrocardiogram in clinical medicine and its correlation with the echocardiographic examination. The student learns how to perform a 12 Lead electrocardiogram and interpret a normal EKG. Abnormal EKG morphology, conduction disturbances, and rhythms are taught. Implications of abnormalities are discussed. This course is designed to provide the echocardiography student with the necessary foundation of knowledge and understanding to deal with the patient in a clinical context. It also provides the student with the information necessary to perform basic and semi-advanced cardiac procedures utilizing 2-D imaging, M-mode, and spectral and color Doppler. High-quality image production, recognition of normal cardiac structures and pathologic states relating to various types of cardiomypoathy, murmurs and valvular heart disease and cardiac transplantation are stressed. Examination protocols for various procedures, review of anatomy, film reading and use of other scanning techniques and modalities are addressed. This is an internship course. A continuation of ECHO-401. The course is designed to provide the echocardiography student with the necessary foundation of knowledge and understanding to deal with the patient in a clinical context. It also provides the student with the information necessary to perform advanced and sophisticated cardiac procedures utilizing 2-D imaging, M-mode, spectral and color Doppler. High-quality image production, recognition of normal cardiac structures and pathologic states relating to cardiac diseases secondary to systemic illness, infiltrative heart, neuromuscular, and connective tissue diseases, endocrine and nutritional diseases, hematological disorders, AIDS, and pericardial diseases, cardiac tumors and thrombi, and diseases of the great vessels are stressed. Examination protocols for various procedures, review of anatomy, film reading and use of other scanning techniques and modalities are addressed. This is an internship course. This course is an introduction to stress echocardiography. Emphasis is placed on the basic coronary artery anatomy, physiology, pathophysiology, medical indications, fundamental principles, techniques and scan interpretation. Various methods of stress echocardiography such as digital, exercise, and pharmacological echocardiography are stressed. Students observe and perform these procedures during a clinical internship. This is an internship course. Classroom and laboratory experience will provide the candidate with basic knowledge necessary to perform M-mode scans. High-quality image production, measurements, recognition of normal structures and basic pathologic states will be stressed. Examination protocols, review of specific anatomy, film reading, and use of other scanning techniques will be addressed. This is an internship course. This course is designed to provide the echocardiography student with the necessary foundation of knowledge and understanding of congenital heart disease with an emphasis on the ultrasound approach. Two-dimensional real-time imaging and Doppler techniques are presented. Performance on laboratory equipment is stressed. This is an internship course. A continuation of ECHO-430. This course is designed to provide the echocardiography student with the necessary foundation of knowledge and understanding of advanced congenital heart disease with an emphasis on the ultrasound approach. Two-dimensional, real-time imaging and Doppler techniques are presented. Performance on laboratory equipment is stressed. This is an internship course. This course introduces the echocardiography student to the various techniques, procedures, and skills necessary to evaluate the heart. Topics include transesophageal and contrast echocardiography, and pericardiocentesis. The role of echocardiography in emergency medicine, operating rooms, and intensive care units is stressed. This is an internship course. This course is designed to introduce the student to the role of the echocardiograher, ethical issues and career opportunities in the medical field as well as provide an overview of the fiscal and daily operations of an echocardiography department. Speaking, writing, and researching skills are explored. This course also presents methods for researching a selected topic, developing paper-writing strategies, and making oral presentations. Students will research a topic and prepare a written document following common publishing guidelines in addition to making oral presentations. This is an internship course. This course prepares the student for application of classroom knowledge to the practice of echocardiography by means of a clinical internship. Performing basic, and some advanced echocardiography examinations in both the laboratory and clinical settings is stressed. Nursing procedures, ethical issues and medico-legal considerations are also discussed as they relate to the practice of echocardiography. The candidate is expected to perform basic and advanced examinations with little, if any, assistance by the end of this course. This is an internship course. This course provides the final development of echocardiography examination skills by means of clinical internship. The candidate is expected to perform general, advanced and sophisticated echocardiography examinations with no assistance by the end of this course. This is an internship course. Information regarding costs and the U.S. Department of Labor’s Standard Occupational Classification (SOC) code and occupational profiles for this program can be viewed at www.rit.edu/emcs/financialaid/gedt/echocardiography.html.